I am writing to you because I trust your style and I love esb! My mom bought me this dress from bhldn (yikes!) for my small low key wedding and I have to wear this because I am a good daughter and I love her. plz plz help me, how do I make this whole outfit look good? shoes? jewelry suggestions please. Thanks! Seriously? Whose mother buys their wedding dress? More specifically, I would think: whose mother buys their wedding dress with what seems like no input from the bride? RIGHT! A "surprise" wedding dress? That isn't a thing. You could wear it to the rehearsal if you feel that you do, in fact, need to wear it. But unless your mom is paying for everything, you should be able to choose your own dress. Bhldn accepts returns. If your mom bought this for your because she really wants you to have a wonderful, happy wedding then she definitely doesn't want you to wear something you secretly hate. If she is going to hold it against you, then she's being selfish and that's all the more reason to wear the dress *you* want to. What do you actually want to wear? 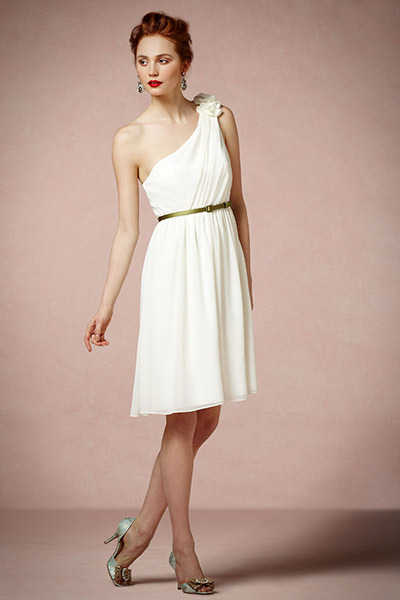 I actually like this dress, but then, I am a sucker for the "Grecian goddess" vibe... I think the big question is whether *you* like it. And if you do, I would love to see what the great shoppers who read this blog have to suggest. What is your style? If you don't like it: why don't you like it? I suggest calling your mom and telling her you appreciate that she wants to help you with your wedding, but you (a) were imagining a different style of dress (then tell her which kind); or (b) don't think this dress looks good on you (and why); or (c) want to go dress shopping for the experience; or (d) already bought a dress (but then buy the dress before you tell her)... Then either wear it to another event (like the rehearsal dinner, as someone suggested) or return it (as someone else suggested). Be firm but kind, and don't make a big deal out of it. Has she actually seen you try it on? If not, tell her it doesn't fit. If she has, tell her you're saving it for your rehearsal/bachelorette party/shower/honeymoon/engagement photos. Guys, she asked for help finding a shoes and jewelry, just find some f'n shoes already. Is this a fake letter? great question tonia! also, i like that dress! i feel like bhldn gets shat on a lot in this community just because it's bhldn. anywho, if this is a legit letter, good luck to OP. weddings are full of negotiations, so maybe having a honest discussion with your mom might be a better idea than trying to accessorize a dress you despise. If she saw what you just wrote she would probably be upset that you were trying to wear a dress you didn't want to wear on your wedding day. Pull it together. Yes, I am really confused about this whole dynamic, why would your mother buy you a WEDDING dress that she hadn't even consulted you on?? say thanks, but no thanks. and go buy yourself something you like. I don't get this 'good daughter' guilt thing.. I'm a good daughter and I would still straight up tell my mom that I appreciate the thought but would regret not having the chance to pick my own dress, etc etc.. be nice, but firm. agreed! wearing some dress your mom bought does not equal being a good daughter. This question is both weird and boring. That's exactly the way I read it. You're right about the shoes and accessories, I still need opinions on those plz! I've showed her a dress that is somewhat similar style to that dress but the fabric and belt is all wrong. @Anon 12:23, I'm assuming your the OP? Clearly we're a gossipy bunch, and we're dying to know why you have to wear this dress that you don't seem to like very much. I worry that you won't get many suggestions without the juicy details. so you do like the style of the dress... ok, that is a somewhat different situation. i guess. shoes.. we need ideas of what your style is?! heels, flats, sparkly, colourful? Both my mom and sister are from Cali and I live in Chi town, they both had court weddings so I try not to make my wedding a big deal to them. Anyways to make a long story short, I've been exchanging emails with my mom and showed her a sample of the dress I had in mind. She then got me this dress as a surprise since it's a low key wedding anyways, whatever. I guess I really don't have to wear this dress but I'm going to anyways without that whole (romantic bhldn style). I went to the store and exchange it with the right size and I'm going to add a little edge to it. I am thinking of these shoes.http://preview.tinyurl.com/puhd5ly any thoughts? I mean I like these, but girl, wear the dress you want. It's your wedding day. How's about a big wide leather belt? What does good/an edge look like to you? More downtown? More biker? More hippie? What? If you could choose any dress/look, what would you have chosen? You're being awfully "whatever" about this whole thing, and I'm afraid you're shoving down feelings that will later explode. Do you really want a low key wedding, or are you just scared of what they're going to say? Ok...decidedly not a fake letter! So how about these or these? And then stack a bunch of Another Feather jewelry on your wrists and maybe layer a couple long necklaces too, like this. Stay on the minimalistic/modern side of Grecian Goddess and you'll look awesome. OMG! That white wedge and those jewelry! THANK YOU! Are you doing a veil? I vote no...but depends on what's going on with your hair. Is it long or short? A wedding-y version of this could be really cool with the neckline on your dress and the "cool girl goddess" vibe. If you're old enough to get married, seems like you should act like an adult and tell your mom thanks so much, but it wasn't what you wanted. She won't die from getting her feelings hurt by the way. Jesus.